Climate, topography, and many other features of what is collectively called the biophysical environment influence the lives and livelihoods of humans, as illustrated in the last section. In this section, we look at the idea of human culture more generally, and examine the way our expectations and preconceptions can sometimes interfere with the ability to understand a different culture. We often get glimpses of cultures very different from our own on television and in the media. Some of us are fortunate enough to travel abroad and experience these differences first hand. Among the first cultural differences that foreign travelers may encounter are those of language, food, and sometimes dress. Many embarrassing stories are told by travelers about their first attempts to speak a new language or try a new food. For example, the Durian, called the "King of Fruits" in <?xml:namespace prefix = st1 ns = "urn:schemas-microsoft-com:office:smarttags" />Thailand and other countries where it grows, is a big, green bumpy fruit with an interior that some say tastes like custard. The "only" obstacle to enjoying this delicious and interesting fruit is its often overpowering stench. Described as smelling at best like rotting garbage but worse, the reek of the durian can be so bad that many hotels and other public places in Thailandhave special signs forbidding durian in those areas. 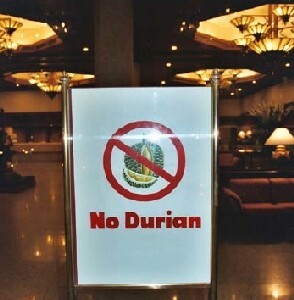 In addition to a "No Smoking Sign" you might see a "No Durian" sign hung politely in a hotel lobby! Over time, some travelers become acculturated, or used to a culture to the point where they may speak the language fluently or crave a spicy dish when they return to their home country. The truly brave may even come to enjoy Durian. ABOVE: Many Thais today view durians with a similar degree of distaste as foreigners who have never encountered them. However, other Thais, especially older persons who remember a time when durians were a more normal part of the diet still enjoy them, much to the surprise of tourists. But while these differences capture our attention initially, some of the largest obstacles to understanding another culture are not so obvious. These more subtle differences may exist between groups that speak the same language, live in the same city, and even believe themselves to be part of the same culture. Such 'cultural' differences present a major challenge to open understanding precisely because they often go unrecognized. When Thai researchers from <?xml:namespace prefix = st1 ns = "urn:schemas-microsoft-com:office:smarttags" />Mahidol University began interviewing Nang Rong residents back in 1984, they had a number of these more subtle cultural barriers to overcome. Different educational levels, different dialects of spoken Thai, and differences between urban and rural lifestyles, were just some of the many obstacles to gaining the trust and cooperation of the local villagers. On the other hand, the great esteem in which these individuals were held by the people of Nang Rong helped secure their cooperation. It took much time and effort to uncover some of these cultural differences and to help everyone involved feel fully understood, both researchers and study participants. When the project was expanded and researchers from the <?xml:namespace prefix = st1 ns = "urn:schemas-microsoft-com:office:smarttags" />United States got involved, the cultural differences multiplied. Like any other traveler to a new place, our research team sometimes brought assumptions with them about what Thailand would be like that turned out to be quite wrong. In most cases these were minor, and often humorous, but they showed the danger of making generalizations about other cultures. I grew up on a farm in central Michigan, so rural life has always been normal for me. The sight of chickens, dogs, and cats running free around the homes of Nang Rong didn't seem strange, nor did the dirt roads, endless fields, and rustic condition of some homes. Living and working with animals was a part of life for me as a child. During the Great Depression in the 1930s, my great-grandparents even kept chickens in the attic of their home so that they wouldn't get stolen! 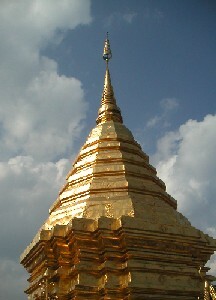 As different as I was told it would be, Nang Rong felt strangely, and unexpectedly, like home to me. 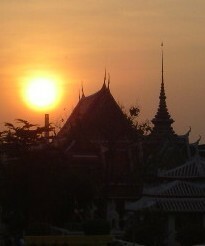 What totally surprised me instead on that first trip to Thailand was Bangkok. 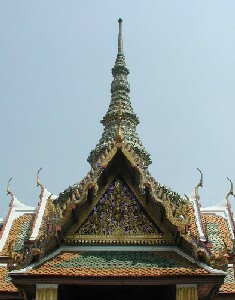 Everywhere I looked in the big city I saw a dizzying patchwork of English and Thai signs, slogans, and familiar logos. Sometimes, standing at a crossroads, you could see two or three 7-11s at the same time. Growing up where I did, if a town had one of those, it was considered to be "on the map." We had just finished dinner in a Bangkok restaurant and decided to take a stroll down one of the many crowded sidewalks of the sprawling city. The thought of a frozen drink sounded like the perfect dessert and a few minutes later I was sitting on the curb outside one of the hundreds of 7-11s enjoying a very non-traditional Thai sweet: a strawberry-mango Slurpee. At that moment I noticed a young elephant just a few feet away, plodding towards us. A frequent sight in Bangkok until recently when they were outlawed in the city, elephants were a popular attraction, especially among tourists. The elephant stealthily approached a street vendor's cart as its young trainer, or mahout, feigned mocked dismay at the elephant's attempts to steal food from the vendor's cart with his trunk. The vendor, clearly angry but still smiling, shooed the elephant off and it lumbered up the street led by the teenage boy. 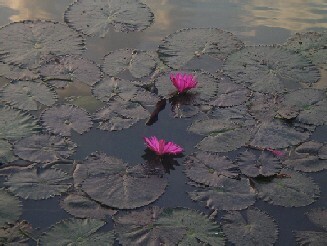 In that moment, a few more of my preconceptions about Thailand evaporated. Time and time again, whether in urban Bangkok or rural Nang Rong, I found myself confronting familiar and ordinary things alongside the novel and the unexpected. That's the way it is in Thailand: one minute you could almost imagine you were Chapel Hill or Chicago; the next, along comes an elephant to remind you that you're a long, long way from home. Monks in flowing saffron robes talking on cell phones, street vendors selling live chickens and phone cards, and hazy sunrises over temples and skyscrapers were just some of the sights that helped tear down our American stereotypes about Thai culture over the years. But it takes more than an open mind to bridge the very real gap that can exist between cultures. ABOVE: Would you care to walk barefoot in a rice paddy? Some of the most common, everyday activities may seem strange or even scary to someone from a different culture. Likewise, things that seem appropriate in one place may be thought very rude in another. A Thai farmer may not think anything of walking in his or her field, but might be quite taken aback by a Westerner who entered his home without removing his or her shoes and washing the feet. On more than one occasion when talking to villagers through translators, they would use words for which there simply was no good English translation. It is tempting in such instances to find a word in English that is close, and just use that, but over time this solution tends to mislead us: pretty soon we forget entirely that the English word is a crude approximation. In some cases, when the villagers described complex rural-urban patterns of population movement or the intricacies of land ownership, we chose to continue using the Thai words in order to retain the true meaning. Such examples equally demonstrate one of the many crucial role that the Thai members of our research team played - without their fluency in both the English and Thai languages, our collaborative project would never have succeeded.